As part of the 22nd annual Chicago Neighborhood Development Awards (CNDA), Chicago-based JGMA’s El Centro, along with projects from Chicago-based Landon Bone Baker and Gensler, were awarded Richard H. Driehaus Foundation Awards for Excellence in Community Design. 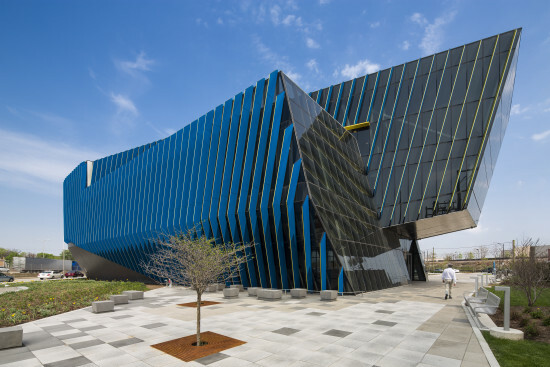 Finished in late 2014, El Centro is a 56,000 square foot satellite campus for Northeastern Illinois University, located along I-90/I-94 on the north side of Chicago. JGMA lead Juan Moreno describes the buildings trademark yellow and blue fins as building promotional, psychological, and sustainable. Promotionally, they function as a billboard for the school. Psychologically, they are a point of pride for the student body. And sustainably, they are a one of the buildings sustainability systems as sunshades, along with solar panels and the darkly tinted glass. El Centro was also awarded an AIA Chicago Distinguished Building Honor Award, and the 2015 Chicago Building Congress Award. Juan Moreno’s commitment to the school goes beyond designing their building though. During moving his acceptance speech, Moreno brought the 1500 person crowd to their feet, and many to tears, as he explained his plan for the award money. Addressing Richard Driehaus, “Four years ago I was on this stage for the first time. It was in my firm’s second year of existence, and what you don’t realize Mr. Driehaus is, that in your celebration of architecture, that award money that we received kept our lights on.” Moreno continued, “I’m very much interested in paying it forward. I’d like to announce that the money we receive for this award is going straight to NEIU El Centro to start a scholarship.” Moreno went on to explain the scholarship, which would be in the name of his Colombian immigrant mother, would be used to help minority students, the majority of El Centro’s students, to travel the world. After Moreno left the stage, Richard Driehaus returned to the mic to announce that he would match Moreno’s gift to the school. Landon Bone Baker and Gensler projects were also honored with the 2nd and 3rd place awards. Landon Bone Baker’s South Side Dorchester Art + Housing Collaborative was commissioned by Chicago artist and community advocate Theaster Gates. Original a series of separate buildings owned by the Chicago Housing Authority, the donated property now includes market-rate apartments for artist, public housing units, and reduced-rent units for limited income families, and community spaces for dance and music. Gensler’s Town Hall Apartments reuse a former Chicago Police station for affordable senior housing for the LGBT community. The Richard H. Driehaus Foundation Awards for Excellence in Community Design is one of eight other awards given out at the CNDAs, which is organized by the Local Initiatives Support Corporation (LISC ) Chicago. The CNDAs honor architects, developers, neighborhood advocates and business leaders who work to improve the city’s neighborhoods through restate development. 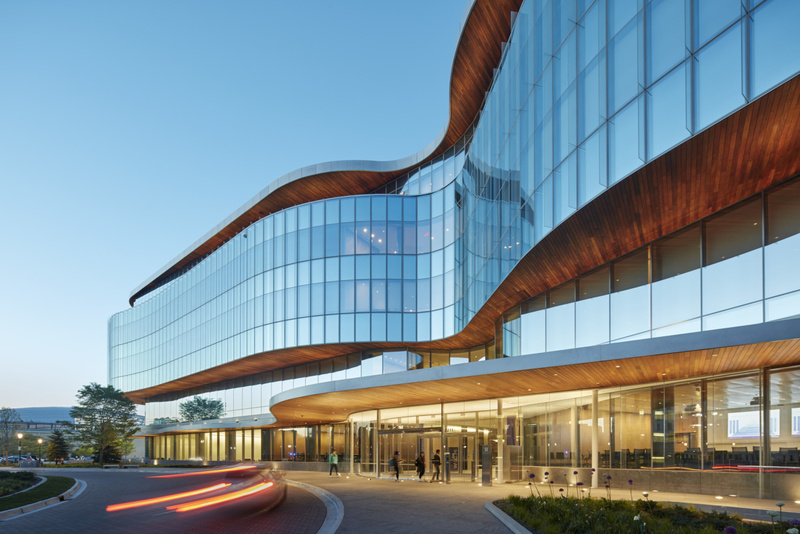 Aside from the Driehaus Design award, other awards are given out for community planning, non-profit real estate projects, affordable rental housing preservation, for-profit real estate projects, and community development organizations. Winners in these other categories included the Salvation Army Ray & Joan Kroc Corps Community Center, the Oakley Square affordable housing, and the Method Products’ South Side Soapbox. The Method Products’ South Side Soapbox, a LEED Platinum soap factory which, as Mayor Rahm Emanuel stated in the ceremony’s closing remarks, “ is the first factory to be built on the South Side in 30 years.” The brightly adorned factory derives 50 percent of its energy from solar and wind, and includes the largest rooftop greenhouse in the world. Located near the historic Pullman neighborhood, the project has been touted as a symbol of the rehabilitation of the area, which has been economically depressed since the Pullman Palace Car Company ceased operation in the 1960s.